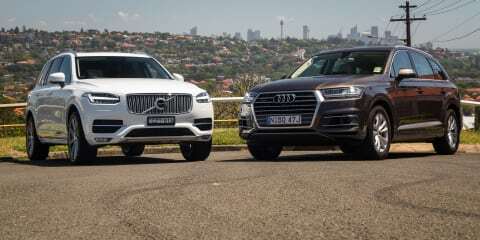 Two giant releases on the large-SUV radar this year, the Audi Q7 and Volvo XC90, seem intent on reshaping the seven-seater landscape with aligned vision and purpose. Surprising, perhaps, given how differently the Swedish and German brands have been traditionally perceived, but also how different this Big Boy pair are by all appearances viewed from 50 paces. However, the reinvented Q7 and XC90 both come from the same place: to cast jumbo-sized halos around their respective makers’ badges. And they do so with similar execution: want-for-little design, tech, comfort and bells-and-whistles luxury, all wrapped up in strong pitches of innovation and forward thinking. “Brand ambassadors,” as James called the XC90 in review: premium heap-toppers intent on making their mainline stablemates look dull, under-equipped and wanting. The pair does move the large SUV game forward, or at least want to break tradition trying. For one thing, both models question convention that flagship family haulers need to be overweight, try-hard sportscars – there’s no S or RS version currently slated for the Q7, and the Volvo’s global top-spec is the hyper-luxurious Excellence variant. Instead, from their lavished leather-dipped seven-seat appointments to digital-overload occupant interfaces, it’s the luxury and technology that rules. They’re so similar in this approach that you wonder if their makers were peering over each other’s shoulders during their gestation stages. Volvo’s confidence in the revamped XC90 range is reflected in the price hike that has the big Swede rubbing shoulders with the Germans and Brits. Our D5 Inscription diesel test car, at $95,950 sans options and on-roads, is second-lowest on XC90’s seven-strong petrol/diesel/hybrid fleet spanning $89,950 through to $122,950 (see range pricing here). Audi has made do with one Q7 trim level in Oz to date: the 3.0 TDI quattro tiptronic. So, of course, a diesel, all-wheel drive and automatic. At $103,900 pre options and on-roads, it’s an $8050 hike over the D5 Inscription, while boasting a similar powertrain format. Audi’s one-size-fits-all Q7, though well-equipped, is essentially a Build Your Own Spec Level springboard for buyers. Just add a pen and an options list (plus, presumably, a stiff drink). Our test car ticks nine options boxes, leaping the list price – gulp – $129,850 before on-roads. The Volvo, too, has nine extra-cost additions, lifting as-tested list pricing to $113,150. It’s not all cashmere headlining and Swarovski-studded door handles as mere indulgence, either. Some of the options ought to be standard issue, given the pair’s premium pitches. Many buyers might likely steer clear of our Q7’s brushed aluminium and walnut cabin inlays ($2170), Bose 3D sound system ($2775) and tricky Matrix LED headlights ($5500), but it’s a little rich to charge extra for four-zone ‘deluxe’ air-conditioning ($1950), Audi Connect ($750) and metallic paint ($2400) for a six-figure SUV. If you want adaptive cruise control and Active Lane Assist, the Assistance Package adds a further $4075, ambient interior lighting another $1380. The biggie, though, is the superb adaptive air suspension that’s garnered praise in reviews past, which wants for $4950. Volvo wants $3760 for its air suspension with switchable adaptive damper package, though, somewhat crucially in context of comparison, it’s not fitted to our test car. Our XC90, though, gets a powered panoramic sunroof ($2950) and niceties such as upgraded ‘comfort’ Nappa perforated leather ($2950) and huge 21-inch wheels ($2825). And like the Audi, items such as metallic paint ($1750), front seat heating ($375), tinted rear glass ($850), power adjustable side seat support ($350) and tyre pressure monitoring ($150) should be additional charges. So, for a brand so tied to a reputation for safety, the eye-raiser is that active smarts such as Lane Keeping, Distance Alert and Rear Collision Warning is an extra cost bundled in with 360-degree Park View Camera, head-up display and Intellisafe Assist with adaptive cruise control in the $4000 Driver Support Package. So it’s a not-so-level, oh-so-murky playing field, then, on which to judge proper value between the pair. But if you were to sit the Volvo on standard (Audi matching) 19-inch wheels and drop the glass roof and primo leather indulgences – and add those essential cost options to the spec – the now $104,425 XC90 overshoots an un-optioned Q7 by just $520 with the Swede’s full suite of Driver Support trickery included. And, thus, the Volvo edges ahead in the value stakes. The cabin space is the centerpiece of any SUV experience, and it’s here that both protagonists are simply sensational. In presentation. In airs of luxury. In slickness and tangible quality. In detail. The holistic experience, be it user interface or sheer feel-good factor, both competitors move the game forward, against their stablemates and against segment rivals. And yet they’re quite different. In both vehicles, the cornerstones of design is a dual-screen arrangement of slick digital drivers’ displays – the command centres of sorts – and large dash-mounted infotainment. It’s not new, though certainly new-school. Form here, the designs take different tacks. The Audi favours extravagance to its 8.3-inch display in supplementary glass-finished MMI touchpad and ‘glowing preview’ button control. The Volvo aims for minimalism, with simplistic controls and its gigantic 12.3-inch iPad-like touchscreen. I prefer the Volvo system. Most of the rest of the CarAdvice crew liked the Audi method more. Neither is better, per say, though they’re different enough highly influence the buying decision depending on taste. The Volvo’s appeal is that it cleans up and slim-lines the cabin design. For instance, the neat tablet-like design of the main touchscreen allows access to most of the XC90’s functionality in a quick swipe of a finger, fingernail or glove – all of the driving assist switches, for instance, are laid out clearly on one screen. Ditto the driver’s instrumentation, a thing of utmost simplicity and clarity of design. Bar the stubby transmission selector and basic audio and demister adjustment, the centre stack and console are bereft of controls. The Audi has more bells and whistles, taking the streamlined Virtual Cockpit concept of the TT and, conversely, applying visual overload. It’s an information bombast and – judging by my colleagues’ reactions – there’s a lot to love. Similarly, the Volvo presents a concise, compact steering wheel; the larger Audi wheel more excessive. The Q7 button and switch extravagance does offer quick shortcuts to many functions, though it requires familiarity to negotiate – though, annoying, some vehicle adjustments require digging into onscreen submenus. The Volvo’s front heated/cooled seats look sporty, though they can be adjusted between rib-hugging and completely relaxed via side bolster/lumbar/cushion electric adjustment which, handily, presents a visual guide via the infotainment screen. All the touch points around the cabin are supple and first-rate. The Audi has more relaxed, plainer seating, but it feels plusher and slightly more comfortable than the Volvo’s more firmly padded buckets, which strike a nicely low-slung though offer good outward visibility. The Audi offers a slightly better view of the world beyond the glass and you sense the vehicle’s perimeters more confidently, though both offer seat highs that don’t require most adult occupants to drop to the ground/road/footpath during egress. The Volvo’s second row seating apes the front bucket seat design in the outboard positions – a sort of two-plus-two effect – where knee, toe, shoulder and head room is generous. In both SUVs, the bases and seat backs can be mechanically adjusted for comfort. There’s a neat touchscreen in the centre console to adjust temperature and fan speed for the true four-zone climate control. The door bins are large, and there are two map pockets but only one 12v outlet. If there’s a gripe in the second row, it’s that the middle position lacks anything like comfort for long hauls, but there are extra air vents in both the B and C pillars to keep all passengers comfortable. The Audi gets a true four-zone climate treatment, too, with individual temp controls (you can child lock the controls) and, like the Volvo, just a single 12V, but there are no air vents in the third row. Again, it’s arier than the Volvo in the middle row, the centre seating position more comfortable and useful for adults, while roominess in every direction is superb. Like the Audi, the Volvo gets three child seat tethers and Isofix points in the outboard positions. To access the third row, both offer a sort of flip-fold design with easier walkthrough access. The XC90’s third row is very tight, best for young kids only, though they are provided with cup holders, vents and storage cubbies, and the flip-forward second-row seating allows easy access into the rear-most row. The Volvo’s bootspace is a decent 451 litres, but the third-row seats fold quickly in a one-handed movement, the headrests tucking themselves automatically to produce 1102L load space as a five-seater. The cargo area expands to a huge 1951L with second row stowed. The boot features a single 12V, gorgercy bag hooks on either side, and the reasonably high set floor that hides a space-saver spare wheel. Sadly, there’s contingency for towing the luggage blind. The Audi can’t match the Volvo’s luggage-swallowing prowess, allowing a more compact 295L as a seven-seater and 700 litre with five seats in play, though it milks a narrow four-litre victory (of 1955L) once the SUV is converted into an impromptu two-seater van. The third row can be erected and stowed electrically via a switch, though the low load floor doesn’t allow the fitment of a spare wheel. Both excellent, both different, it’s tough to split the pair for all-round interior goodness. Personal preferences apart, the edge the Audi exhibits in space and comfort pushes it ahead for accommodation, if by the slimmest of margins. Audi has rightly made much noise about Q7 losing a quarter-ton of heft in this new-gen Q7, though it’s still formidable at 2135kg. The XC90, though, presents a notably healthier 1965kg weighbridge ticket. But it’s the German that comes with a significantly more impressive 0-100km/h claim of 6.5sec against the Swede’s lackadaisical 7.8sec. And that’s because the Audi swings a much larger stick. The 3.0-litre turbodiesel six under the Q7’s bonnet plies 200kW, which arrives at just 3250rpm but hangs around for a further 1000rpm. The XC90’s diesel is a four cylinder of just two litres of capacity, making a lower 169kW at its 4250rpm peak. No prizes for guessing that, instead, torque is the biggest factor at play with these large land barges, the Audi offering a robust 600Nm compared with the Volvo’s modest 470Nm. And the Q7’s peak 1500-3000rpm spread looks, on paper, to be the more flexible unit, given the XC90’s maximum shove is only available in a narrow 1750-2500rpm range. There’s nothing sluggish about the Volvo. Nor is its engine noisy by rattly diesel-four standards. It’s just that against the Q7 it pulls short straws everywhere. Like the Audi, it’s tied to an eight-speed conventional automatic – both, too, have all-wheel drive – though there’s slight lag on initial throttle take-up and, even without passengers or luggage, the engine feels and sounds to be working hard for its keep when called to march. When cruising or under constant throttle, though, the powertrain becomes a quiet, confident and relatively refined accomplice. The Audi is so quiet at idle you mightn’t pick it as an oiler, while under load there’s muted hum as it faithfully propels all and sundry forward at a heady clip with immediacy and superior effortlessness. And its marriage to the eight-speed is utterly silken. But it’s the silence of the Q7 during more leisurely driving that is quite astounding. On smooth hotmix, cruise control set on a highway, the Audi is so deathly silent that you’re likely to only hear air passing through the ventilation system. Or your own heartbeat. The Audi’s ride, in Comfort drive mode using the optional air suspension, is perfect. Not great. Not exceptional. But perfect. Or, at least, better than any car I can remember driving in the past few years. To illustrate, I have one wonderfully terrible road in inner Sydney I use to test ride quality, paved with uneven concrete slabs separated by randomly sharp edges that is so densely trafficked that local council might never fix it. I’ve never driven a press car down it that hasn’t ironed it completely flat in the driving experience…until the Audi Q7. The road forms a loop using adjacent streets riddled with speed humps: some long and square-edged, others tall and narrow. Proper damper killers. And not only does the Audi cushion the suspension compression stroke supremely, the Q7 settles on rebound with an immediacy few other cars could match. The steel-sprung Volvo is good – very good – but in terms of a wafting, cloud-like ride, the Audi is about two cuts above its rival…and probably most cars three times price that might wish to challenge. And while the optional lower-profile 21-inch wheels of the Volvo undoubtedly contribute to the disparity between the it and the 19-inch high-profile-riding Audi, the differences seem mostly down the suspension design and Audi’s deft tuning of its air-based system. The caveat is that Volvo offers air suspension not fitted to our test car. And, equally, the Q7 comes standard with a steel-sprung design. In which case, it would be remiss to penalize the Volvo breed without parity in play. However, there’s enough in the rest of the holistic driving experience to put the Audi in front for on-road performance. Especially weighing in the surety of handling. Activate dynamic mode, and the Q7 is surprisingly adept at carving up back roads. More so than the Volvo. Not from a playful dynamic ‘driving’ sense, but in the degree of road-holding confidence in wet or dry, the accuracy with which the Q7 can be placed in corners, its stability and reactiveness during those too-hot corner entry estimations that can catch up the meekest drivers with the most innocent driving attitudes. The Audi stops, turns and generally gets you and your loved ones out of danger way more keenly. The Volvo is no slouch. In fact, its steering is a little lighter and more direct, and if there’s a markdown to its rival, it’s that the Audi’s steering feel is comparatively numb. It’s just that, no matter what the on-road situation, the German is more complete. Even if, with its high eight-litre test fuel consumption average (7.4L/100km claimed) is thirstier than the Volvo’s demonstrably more frugal low-seven-litre thirst (6.2L/100km claim). If there’s one area the Audi frustrates, it’s in its active safety systems. Both SUVs tested were fitted with semi-automated steering for lane-keeping, and while the Audi system can be tuned it’s downright intrusive to the point of being unusable, particularly on motorways. Where the Volvo waits until its wheels align with lane markers, the Audi fights hyperactively against the driver’s steering input, or steers erratically if left to its own devices. Neither car’s safety system seems ideally attuned to Australian urban application, such is their conservatively heightened intervention. Both emit collision warnings or activate crash mitigation in unwarranted situations, but the Audi is the more annoying culprit, incessantly bleating danger signs that, at times, distract from the actual driving at hand. Quite why the blind spot indicators in the wing mirrors glow like reading lights at cars fully visible – particularly in events where I haven’t indicated to merge – is beyond me. In terms of ownership, both SUVs are covered by three-year/100,000km warranties with three years of roadside assist. Service intervals are 15,000 kilometres or 12 months, whichever comes first (Audi’s currently capped at $1900 per service). Interestingly, the pair polarised those of the CarAdvice team who drove them – to the point of argument – more so than any two-up comparison in recent memory. And the one aspect that drew battle lines deeper than any was the pair’s exterior styling. If there was one apparent deal-breaker, consensus chimed, it was the Q7’s looks. Only two staffers – myself included – not merely could live with the Audi’s styling, but actually liked it. It’s quite a pertinent point with this match-up. Perhaps in choosing the right option, many buyers might simply go where bold-faced appeal takes them And given that both are exceeding fine vehicles brimming with enough all-round goodness to move the goalpost for large premium SUVs, that’s as good enough reason an any. But, as is CarAdvice review tradition, the eye of the beholder doth not impact on rating the better competitor, let alone functions to appoint a victor. With all else taken into consideration, the Audi takes this win for rising just a little higher to the occasion.